The late 1960's was hit by a wake of murders by Charles Manson and his so called family thus cementing his legacy into the annals of history, it also became a whole new set up for films. 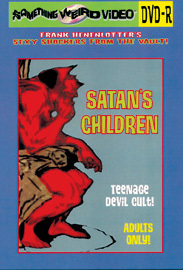 'SATAN'S CHILDREN' is no different as the troubled teen Bobby Douglas fed up with his stepfather picking on him and his stepsister always trying to get him into trouble, whether it be through something petty or just trying to get him turned on. After an incident at the dinner table where Bobby's stepsister informs daddy dearest that Bobby has some strange looking tobacco in his room, Bobby decides its time to leave and runs out the house onto the streets looking for pastures green. Bobby now homeless goes to a bar where a older man tries it on much to the dislike of a biker guy who hates queers. Befriending Bobby he takes him back to his house, offers him a drink and then does exactly what the guy did in the bar. Unfortunately for Bobby it won't just be the biker that will have his way with him, but all his friends will have a go too. Obviously done with him, Bobby is dumped into a field where a bunch of hippies are playing around and come across his body. Sherry the current second in command of the cult takes him in and cares for him much to the dislike of some other members of the cult. The original leader of the cult Simon returns and punishes Sherry for all her acts of leadership while he has been away and has a polite conversation with Bobby about why he is there and that Satan hates queers. Bobby now angry with what Simon has to say ends up taking matters into his own hands, escaping the cults house and in the process leading two members into the porridge like quicksand that is within the forest. Now free he decides its time to go home and see his lovely stepfather and stepsister, bottling his stepfather and having his way with the stepsister. Where should he go from here? Well back to the cult of course to save Sherry the girl who has cared for him and he has now fallen in love with, as for Sherry well Bobby gives her to the cult where they tie her to a cross and that is where the film ends. 'SATAN'S CHILDREN' is a film of its time, filled with Manson type characters and satanists cults that if you are a troubled teen seems appealing(?). Sure it has its downfalls but in the world of trash cinema this could easily be described as a classic. In this day and age of political correctness this film would most likely be slammed and cut to shreds but as an exploitation piece it has charm. This would end up being the directors second and final film. 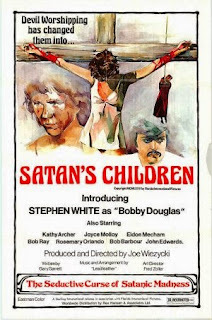 Interesting fact about 'SATAN'S CHILDREN' is that it was shot entirely on short ends, the partial roll of unexposed film stock left over during a motion picture production and kept for later use.